Over the past few days there has been quite a bit of controversy in China over the government’s decision to take crack down on unlawful housing in the wake of a fire and essentially expel large numbers of migrant workers (many of whom were in reality residents of Beijing). Here are some news stories: South China Morning Post | Financial Times. Many intellectuals and others have objected; hence the controversy. Among them is He Weifang, a well-known professor of law at Beijing University and public intellectual — although perhaps I should say “former public intellectual,” since the government has blocked virtually all his access to any public platform. So thorough is the blocking that he has apparently been reduced to sending handwritten messages (remember handwriting?) for circulation by supporters. Here’s his latest. The translation is mine; a photo of the original note follows. 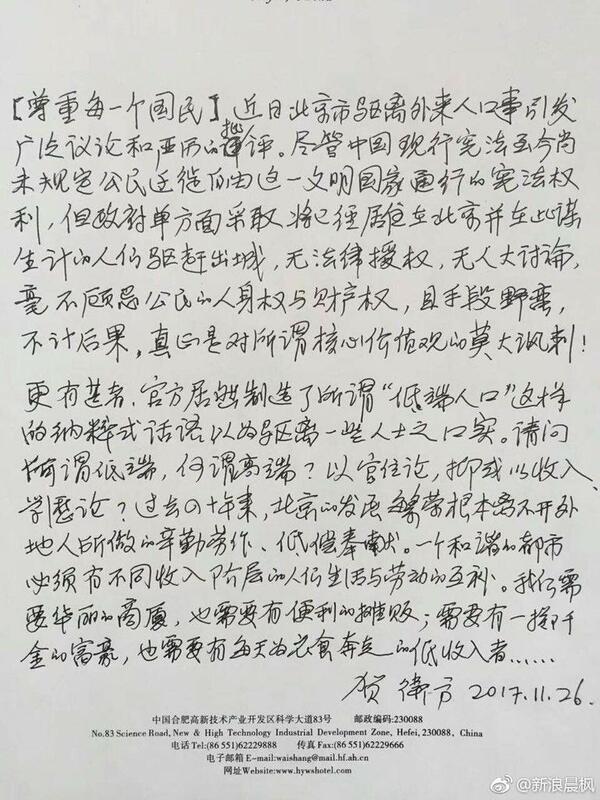 I should add that I don’t know personally that it’s genuine, but it was retweeted by Xu Zhiyong, who probably knows what his handwriting looks like. Suggestions for improving the translation welcome.